Qualcomm is having a very challenging year, but a major cost-cutting effort may improve things going forward. Chip giant Qualcomm (NASDAQ:QCOM) hasn't had a good year. As of its July 28 closing price, the stock is down 15% year to date. Qualcomm has endured a number of challenges that have damaged its business this year. Some of these challenges include the loss of a key customer (which had been widely speculated to be Samsung and the device in question the Galaxy S6), the strengthening U.S. dollar, which has suppressed international growth, a regulatory investigation into its business practices in China, and, if that weren't bad enough, Qualcomm's belief that certain licensees were underreporting device sales in China. 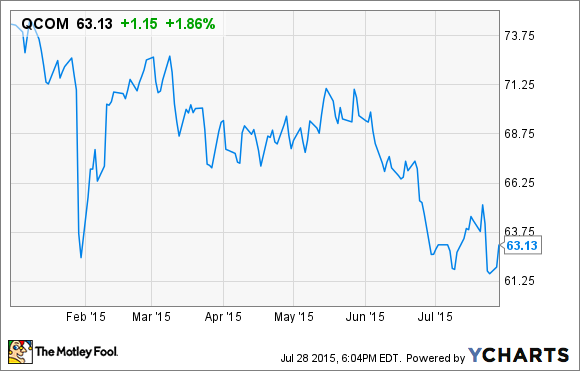 Add it all up, and it's no wonder Qualcomm's stock has suffered so far in 2015. But after reporting disappointing quarterly earnings results, Qualcomm unveiled a major restructuring plan that could finally give investors reason for hope. Last quarter, because of all the factors I've mentioned, it seemed that Qualcomm couldn't do anything right. Qualcomm's revenue and GAAP earnings per share declined 14% and 44%, respectively, year over year. Earnings per share sank to $0.73 per share last quarter, which looks like an alarming deterioration. But it's worth noting that Qualcomm took a variety of non-cash charges against GAAP earnings last quarter that aren't expected to recur. Qualcomm took $975 million in charges to resolve the regulatory investigation in China. It also prepaid $950 million to secure long-term capacity commitments with one of its circuit suppliers. It announced a major restructuring, which promises to streamline the company and reduce costs. And it seeks to reduce its costs by $1.1 billion annually starting in fiscal 2016, in part by reducing its workforce by 15% and cutting its stock-based compensation by $300 annually. Despite all the problems with Qualcomm's operations right now, the restructuring plan could work out as management hopes. Getting leaner, reducing costs, and aligning its share compensation plan with shareholder interests are all promising steps. Management expects margins to improve significantly over time, as a result of these actions. Specifically, the company is guiding gross margins to reach 16% by the fourth quarter next year, and a longer-term objective of 20%. Furthermore, management can use a portion of the cost savings to direct investment toward higher-growth areas in the future. By right-sizing its cost structure, Qualcomm can pursue a smaller but more profitable set of opportunities, such as data centers, small cells, and the Internet of Everything, which is an exciting area in which devices, places, and people become interconnected. This is a good sign that the company's aggressive cost-cutting plans won't jeopardize its future growth opportunities. If all goes according to plan, Qualcomm may be able to send even more cash to shareholders, which is an attractive scenario. Qualcomm has a ton of cash on the books. At the end of the last quarter, the company held $35.2 billion of cash and marketable investments, up 7% from the same time last year. Even though revenue and earnings are declining, Qualcomm is still a strong cash generator: The company raked in $1.7 billion worth of free cash flow last quarter. With its impressive cash flow, Qualcomm maintains a generous cash-return program. The company returned $6.2 billion to investors last quarter, which consisted of $5.4 billion through share repurchases and the remaining $757 million in dividends. Now that Qualcomm has vowed significant cost cuts, it intends to return even more cash. The company plans to return at least 75% of free cash flow going forward. As a result, while things certainly look bad, it's nevertheless a good sign that Qualcomm is taking action. If the turnaround proves successful, the stock's 3% dividend yield and attractive forward P/E multiple of 12 make this look like an attractive buying opportunity.